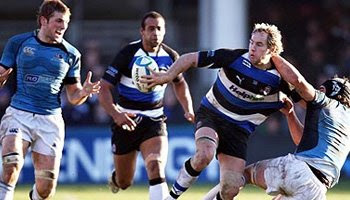 Glasgow travelled to the Recreation Ground on Sunday to take on Bath in the Heineken Cup, with very few having anticipated the type of match that was to be on display. Scoring five tries away from home, Glasgow came oh so close to winning as a late interception went wrong, but if it had come off, would have resulted in a famous victory. Lying second in the Magners League, Glasgow were actually missing their first choice halfbacks, but the youth stepped up and fared excellently against the experience of Bath. The 35-31 win to Bath in the end though sets up a mouth watering return meeting between the two sides in Glasgow, with Bath coach Steve Meehan well aware of the dangers that the Scottish side posses, with his teams defence having to be spot on. Glasgow coach Sean Lineen promised no let-up next Sunday. “Perhaps in the past Scottish teams have just been happy to compete, but these boys are a team of winners,” he said. Note: The audio on this clip is slightly out of sync. We'll update it with a better version soon. Great match. After years of under-achieving Scottish regional sides, it's great to see them competing with traditional powerhouses like Bath (even if Bath have slipped over the last few years). Heineken Cup and 6 Nations need a competetive Scotland and Scottish clubs. Next step: to convert five tries into wins. They must be gutted. Yea I can't bother watching it the sound is too annoying. Looks like it was a great match. Thanks for the extended highlights. But jesus is the sound annoying. Was that Rolland refereeing? He certainly took a far more liberal view of the breakdown than in the England/NZ game. The final Glasgow score comes after a blatant side entry to the ruck, and Bath players were constantly sealing off the ball - makes a mockery of the irb's notion that more vigorous refereeing of the technicalities of rucking will open the game up. At last could this be a new dawn for Scotland?! Godman and Jackson - both exciting attacking fly-halfs (the end of Parks and Paterson disasters). Pace provided from the Evans brothers. Scotland back-row is looking very competitive now with Beattie, Brown, Barclay, Strokosch, White, Hogg, Taylor, Rennie all in the mix - a glut of talent. Very exciting. What a game some rugby!! Glasgow deserved it nearly from what i saw there! I m just wondering, why banahan is not normally selected for england? is he not good enough or something? Aye, it was a great game. I'll definitely be heading to Firhill on Sunday now. First real chance I've had to see a Glasgow game in ages (Friday-night games conflict with work). Both Evans brothers are looking great at the moment! Jaysus, it looks like some of the people who commented here share a rare affliction where the eyes do not function without the ears. It's weird, since most people can remember what they saw less than 10 seconds ago and match it up with what they hear, but it seems like some people can't. You guys must have a God-awful time during storms when the lightning appears a few seconds before the thunder. that video has messed me up ! Rolland was awful. The number of times that Bath came in from the side at the break down was horrendous. Also, how they gave the first try given the Bath player wasn't bound to the scrum and was therefore in an offside position. Rolland single handedly stopped England taking the ABs to the cleaners?...................thats the best joke of the year or you are on drugs mate! "he single handedly stopped England from taking NZ to the cleaners"
why didn't Rolland want England to win, are you saying he was bribed? poor rugby kept England to 13 for a small part (not "most") of the match. NZ were never in jail, they were odds-on to win because they are currently a much better side and they proved that by playing better rugby and winning the game. bored of seeing this video.......new videos!!!!! You read these things, I think the mood has changed for the better!